Assassin’s Creed Pirates will be available on December 5th. 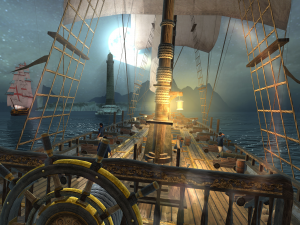 The mobile spin-off of Assassin’s Creed 4: Black Flag, developed by Ubisoft, will launch tomorrow for iOS and Android. The game will cost $4.99 in both platforms, and the players will follow pirate Alonso Batilla on a quest for hidden treasure. The player will take the role of Alonso Batilla, and he is not a pirate when we start the game. We met him as a captive, soon rescued by Captain La Buse. He gives Batilla a ship of its own and we sail to follow several missions. You are going to steer the ship in first person perspective, and the steering controls are simple and intuitive, just swipe left or right along the ship’s wheel to navigate and avoid obstacles. Two bottons allows accelerate you and slow you to avoid the possible obstacles. As controlling the ship is quite easy, you can relax and enjoy the amazing water effects ever seen in a mobile game. That’s the main reason why Ubisoft recommends a high-end device to play. Steering is fine, but the main features are the ship battles, which consist of attack and defense phases. Dragging left and right you aim the cannons. But be careful, the cannons need some time to recharge, and the enemy is shooting back. 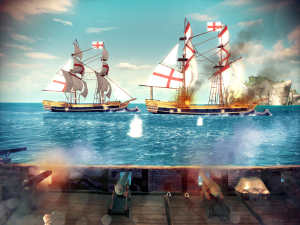 Assassin’s Creed Pirates also includes element of the classic conflict between the Assassins and theTemplars, and several famous pirates like Blackbeard and Bellamy also appear in the game. You can find more information at: Android Central, Ubisoft.